Bella Villa specializes in Italian home décor with particular emphasis on authentic frescos, reproductions of classic Italian art (Etruscan, Roman, Medieval and Renaissance) and collector quality hand painted ceramic art. 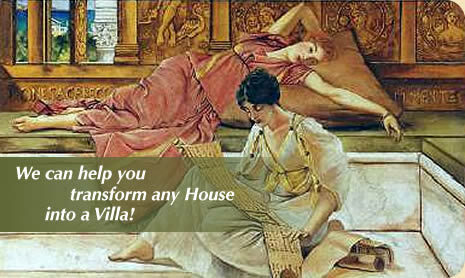 Bella Villa specializes in high quality Italian home décor with particular emphasis on authentic frescos. Other current lines include: hand painted XVII century wooden panels, mirrors with fresco frames, hand painted ceramic panels and plates, and reproductions of classic art. All our products are made in Italy and can be customized to meet your particular needs. We are now offering a special discount on all the items we have in stock. Please call for more information. Our Italian partner is one of the oldest established companies supplying authentic frescos throughout the world. They have the largest selection of designs available and you can also commission a unique piece to match any ambient and theme. Please call or email us if you don’t find in our website exactly what you are looking for and Bella Villa will be happy to assist you. Very elegant and original new idea for mirrors with authentic frescos as frame. Custom sizes and designs available upon request. Sections from frescos and paintings by Old Masters are reproduced as raised plaster on canvas mounted on wood. Decorated bricks are also available from Bella Villa.